Derived from the single-channel video Goats and Sheep (created for the limited edition Gary Hill: Around & About: a Performative View, Paris: Éditions du Regard, 2001), Twofold (Goats and Sheep) consists of two identical projections positioned horizontally side-by-side on a wall. 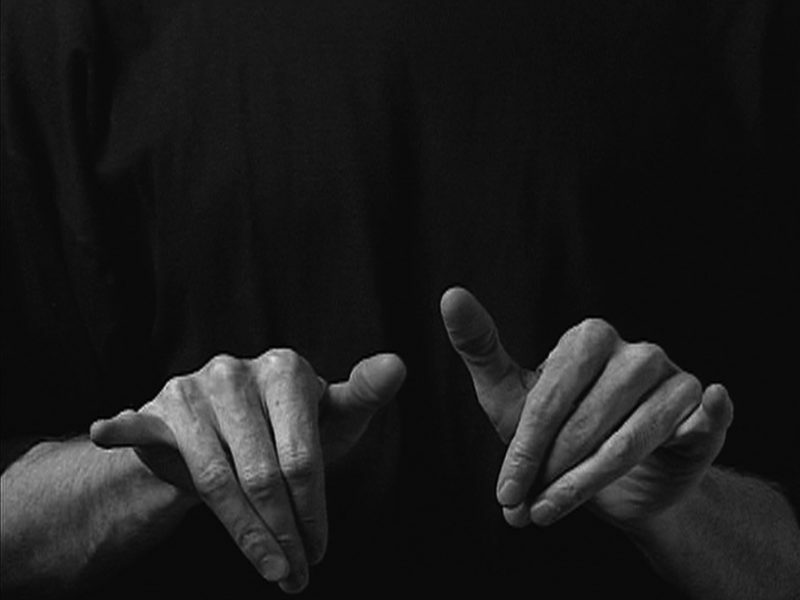 The works use the original text and video source material of the installation Withershins, 1995, consisting of two simultaneous views of a person signing: the hands and arms are framed in one and the back of the head and top of the shoulders in the other. This latter view catches the hands when they refer to the head during signing. The text, which is written by the artist and ‘signed’ in the video, was derived from the original matrix of 420 phrases available in the interactive installation Withershins. 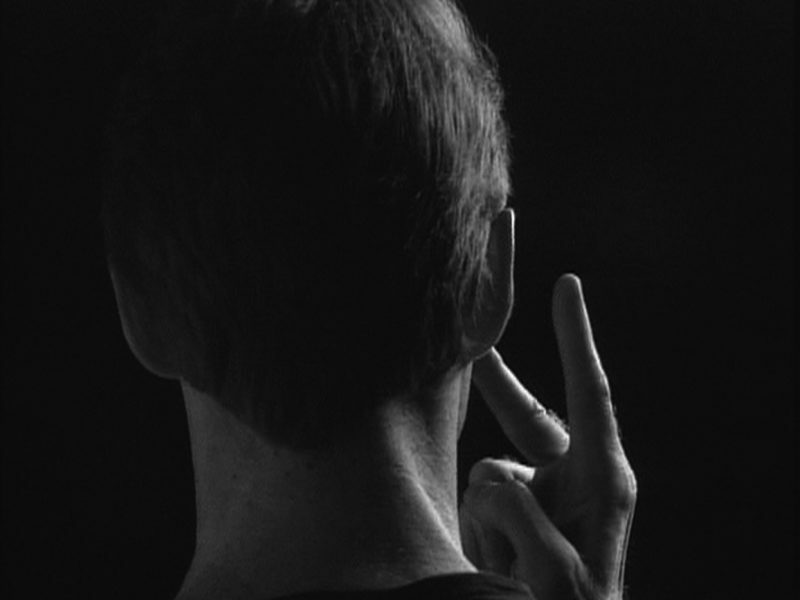 For Goats and Sheep and Twofold (Goats and Sheep), Hill changed the color image into black-and-white; combined the two projections of the hands and arms and back of the head into a single alternating image which switches when the text makes reference to the ‘head;’ and re-recorded his own voice and “re-synchronized” it to the original signing. The stereo field is used to double the voice with about a second of delay added to the sound. This doubling mirrors the hands and numerous references and repetitions heard in the text. “Language Willing,” Barbara Gladstone Gallery, New York, NY, September 14 – October 19, 2002. Note: First exhibition of the work as a separate two-projection installation, to be differentiated from the single-channel version, Goats and Sheep. “Sans commune mesure,” Musée d’art moderne de Lille Métropole, Villeneuve d’Asq, France, September 21, 2002 – January 19, 2003. “Body Matters,” The National Museum of Contemporary Art, Oslo, Norway, January 11 – March 11, 2003. “Rodney Graham, Gary Hill, Joshua Mosley,” Donald Young Gallery, Chicago, Illinois, January 31 – April 12, 2003. “Gary Hill: Images of Light,” Museu d’Art Espanyol Contemporani, Palma de Mallorca, Spain, September 27 – December 30, 2007; Museo de Arte Abstracto Espanol, Cuenca, Spain, January 12 – April 9, 2007. “Digital Aesthetic 2,” Harris Museum and Art Gallery, Preston, England, March 16 – June 3, 2007. Zero Field, Beijing, China (exhibition organized by Institute of Electronic Arts, Alfred University, Alfred, New York), June 16 – 30, 2007. “Gary Hill: Glass Onion,” 911 Media Arts, Seattle, Washington, August 3 – September 25, 2007. “Videnie,” PERMM Museum of Contemporary Art, Perm, Russia, August 20 – October 20, 2009. “Kunstmuseum Wolfsburg at The Hunter Museum,” The Hunter Museum of American Art, Chattanooga, TN, May 26 – October 4, 2011. Sans Commune Mesure: Image et texte dans l’art actuel. (Paris: Éditions Léo Scheer, 2002), pp. 91 (photo only). Lebowitz, Cathy. “Gary Hill at Barbara Gladstone.” Art in America (March 2003), pp. 119 – 120. Kroksnes, Andrea. Body Matters. Oslo: The National Museum of Contemporary Art, 2003, pp. 22 – 23 (and front/back cover photos). Eamon, Christopher. “Becoming Digital: James Coleman, Ernie Gehr, Gary Hill.” Flash Art (March/April 2003), pp. 80 – 83. Scott, Carrie E.A. “Methodical Man.” Seattle Weekly (August 15 – 21, 2007), p. 42. Meigh-Andrews, Chris and Aneta Krzemien, eds. Digital Aesthetic 2. Preston: Electronic and Digital Art Unit (EDAU), University of Central Lancashire, 2008), p. 8 (photo only) and cover photo. Quasha, George and Charles Stein. An Art of Limina: Gary Hill’s Works and Writings. Barcelona: Ediciones Polígrafa, 2009, pp. 329, 331, 337, 345, 347, 350, 548 – 550, 597. Goats and Sheep and Twofold (Goats and Sheep) uses the audio and video source material of the installation Withershins, 1995, consisting of two simultaneous views of a person signing: the hands and arms are framed in one and the back of the head and top of the shoulders in the other. This latter view catches the hands when they refer to the head during signing. The text, which is written by the artist and ‘signed’ in the video(s), represents one possible text derived from a total of 420 phrases that may be accessed by the viewers’ footsteps in the installation of Withershins.